Since mid-2015 there has been a considerable amount of development with Hot Summer Nights 2015, the Elemental Lore Review, and the Teleportation review. Pages with this banner have been affected by development and are in various stages of update progress, but not yet complete. Sorcerers are devastating killers, summoners of demons, animators of the dead, and otherwise generally fun people! If this sort of life sounds appealing, you've come to the right place! If you want to become skilled in these arts, it is not just like flipping open a book and slamming it over the head of your foe. Rather, you can study our arcane arts, study them again, and with enough practice, all these powers can also be yours. Although it isn't too difficult to encapsulate sorcery with some general terminology, these words are lost on those who do not understand their meaning. It should come as no surprise that many of the extant essays in these archives focus specifically on our subtle art. These range from the essays of Lord High Priest Bleeds (his work on True Evil is a modern classic) to the more recent insights of Silvean Rashere. Yet, offering a synopsis of our class to a heathen is not overly complex. Sorcery is the study of the true essence of the world: its manifestation; its power; its forms. We do not shy in fear from undead beings nor those entities from other planes; we summon them or destroy them at will. Indeed, it would be foolish—if not paramount to utter stupidity—to claim any knowledge of the world without studying such things. In our endeavors, we can find slaves and friend alike (both of which will surely assist us). In consequence of such discoveries, we can thoroughly comprehend nature and employ our knowledge methodically, exploiting its nuances to our own advantage. While we are pleased with your interest to join our prestigious ranks, we request that you take a little of your precious time to review our simplistic and modest advice concerning our profession. To become a powerful sorcerer, first you need to use your imagination. How do you envision yourself as a sorcerer? In what specific ways are you powerful? Although you are unlikely to admit it in-game, your sorcerer will have weaknesses, too; which ones can you accept or play off best? Below is a guide to this process, with a slight over-emphasis on mechanics while always striving to offer each player their fair range of options. Historically in Elanthia, sorcery was largely discovered and developed by the dark elves—specifically the Faendryl—which came to prominence particularly during the Undead War. Mechanically, dark elves have an advantage, as the CS for sorcerous warding spells are influenced by both Aura and Wisdom statistical bonuses, which are the highest for this race. Thus, from both a roleplaying and mechanical perspective, it is not overly surprising that a plurality, if not a majority, of sorcerers are indeed dark elves. However, there are many other facets to the decision, and it must be stressed that any race can make a good sorcerer. The advantage in CS is an important factor, but certainly not the only one. For example, unlike many forms of attack, CS and maneuver spell power are not penalized for low spirit (although other unrelated penalties still apply); as there are methods to trade spirit for mana, such as the class-specific sacrifice as well as the Sign of Wracking from the Council of Light, races with high spirit regeneration have a different advantage. 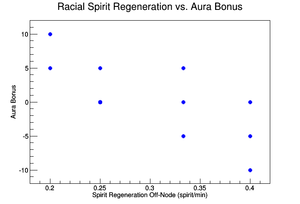 An important point to note here is that aura bonus and spirit regeneration are anti-correlated racial properties; that is, typically the higher a race's aura bonus, the lower their spirit regeneration (see the image to the right). All other things being equal, it is not possible to have a high bonus to CS and a good spirit regeneration; the exception is forest gnomes, partly from their wisdom bonus (which has no correlation with spirit regeneration). If a player is more mechanically inclined, the racial selection can be influenced by their respective bonuses, and certainly the statistics should be selected in accordance with the racial selection regardless. It should also be pointed out that races vary in many ways, such as their innate resistance to diseases and poisons, their natural encumbrance, maximum Hitpoints, different innate bonuses to TD, and so on; although these factors are certainly not irrelevant to sorcerers, they should not play a decisive role in character creation. 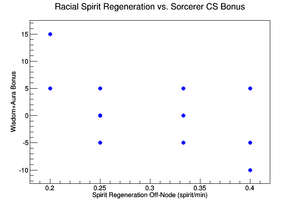 Below is a table of selected differences resulting from racial selection and possible offsets available to sorcerers. Max Health Desire not to be hit; high DS from buff spells; typically in stance guarded. Blood Burst (701) and Ensorcell (735). Encumbrance Factor Knowledge of Phase (704) and possibility to train further in Demonology. Maneuver Bonus Scroll Infusion (714) to extend the life of Prayer (313) and Mobility (618) scrolls. Target defense Access to spiritual, elemental, and sorcerer TD buff spells. Knowledge of Corrupt Essence (703) and Limb Disruption (708). Poison and Disease Access to Disease Resistance (104), Poison Resistance (105), Undisease (113), and Unpoison (114). It is probably most pertinent to select the character's race based more on how the character will be roleplayed than the mechanics. Although above it was emphasized the racial relationship among aura and spirit regeneration, there are enhancive items (in particular Adventurer's Guild Badges), and a dedicated sorcerer can surely find ways to offset any of their weaknesses. To fully explore all the racial options in a meaningful way would be an exhaustive exercise. Instead, a few superficial examples are offered. Choosing a dark elf will seem most natural and offer you many peers; however, dark elves as a whole are more commonly looked down upon by the broader society (whether for fear, distrust, or historical racism). Supposing one chose an elf instead, it should be pondered why an elf from another clan went about learning or acquiring an interest in the dark arts. Paradis halflings diverged from the other halfling clans specifically from their alliance with the Faendryl in the Undead War and the use of demons; although Icemule Trace, the town they founded, no longer outlaws demons, a compelling backstory may be elusive for such a case. Perhaps an Aelotoian sorcerer has tunnel vision for vindictive revenge on the kiramon and merely requires a destructive toolbox. A player may find some insight into choosing a suitable sorcerous persona of a given race by investigating the different cultures of races that interest him/her; however, since cultural selection has very few mechanical influences and is difficult to undo, actual setting of the culture is best left to a later date. In summary, players should feel unrestricted in the racial selection of their sorcerer. Starting to build a general picture of your character in your mind will surely assist in some of the required decision-making processes at the beginning. Still, it is important to keep an open mind so that you can learn more about your character as you explore and interact with the world, because some of the most rewarding experiences are the ones which were not foreseen at the outset. There is a general guide on statistics for new players which is worth reading for its general points. Here the focus will naturally be the points of particular interest to sorcery. Aura and Wisdom are the prime stats for sorcerers; although for some classes the prime stats are not always of the utmost important, these two statistics are extremely important for any sorcerer. One facet of their property as prime stats is that they are automatically added +10 each during stat assignment. They will also determine the base value for your starting mana, which is required to cast any spells—most of what a sorcerer can do! Aura is the stat important for elemental spheres of magic, and Wisdom the one for spiritual spheres of magic. Thus, the sorcerer's Casting strength for the sorcerer base circle takes the averaged bonus from these two stats. Their CS for spiritual spells is only determined by Wisdom bonus, where as the CS for elemental spells is only determined by Aura bonus; however, sorcerers do not learn many of these spells, and most of them are not nearly as powerful as what's available in the sorcerer base circle. A character's aura stat also determines how many spirit points they will have, which can be important depending on the society which is chosen (see below). Finally, these prime statistics are doubled in the calculation of Training points. Of course, because these are prime stats, it also means they have a high growth rate, thus it is possible to initially place these stats to lower values as they will increase rather quickly over time. However, setting these stats to lower values will also inhibit the character earlier in their career in terms of their training points and also CS; for a new player, it is probably a good idea to set these near their maximum of 100 (a setting of 90 before the +10). Logic and Discipline are both important for their contribution to training points and how the affect a character's experience pool size and absorption rate. Although Influence and Intuition are both mental stats, and thus contribute to a sorcerer's mental training points, they are otherwise not very important. Mid-range numbers can be comfortably set here, with favor to Intuition due to its boons for Magic Item Use, Arcane Symbols, Ensorcell (735) and Illusions. The physical statistics, Constitution, Agility, Strength, and Dexterity generally play a lesser role for sorcerers. Their influence to training points is mostly irrelevant, because as discussed below in the Skills section, sorcerers will be converting most of their physical training points to mental training points. Agility contributes its bonus to the character's physical DS; even though sorcerers won't be planning to make many melee attacks, they can still expect to be attacked quite often, and sorcerers tend to survive by not being hit. Dexterity also contributes its bonus to a character's bolt AS, which while not the primary mode of attack for sorcery is a good supplemental offensive method; thus Dexterity should not usually be set too low. Strength and Constitution mainly affect a sorcerer's encumbrance, which while not critical is still useful; smaller races like halflings and gnomes are usually advised to set a high Strength stat because the growth rate is so poor they will almost never increase over time. Constitution also affects a character's starting and maximum Hitpoints, but sorcerers mostly survive by not being hit. Most of the physical stats can be set at low to mid-range values as long as the sorcerer is not optimizing for growth. Obviously, a character cannot have perfect stats in everything at the outset. The racial selection has almost as much importance as the class selection of sorcerer for how to precisely set the stats. In particular, only race influences the statistical bonuses. All other things being equal, when a race's bonus is lower, it is more important to place a higher statistical value, and vice versa. Of course, if one selected a dark elf to maximize CS, perhaps the character should also have high Wisdom and Aura stats to not immediately negate this advantage. Your stats increase as you gain levels. The rate depends on your race and profession. Sorcerers grow stats like Wisdom and Aura quickly, and Strength and Constitution slowly. Because of this growth, it is usually a good idea not to set any one stat to or very close to 100 when starting out, because it spends a lot of stat points that you could have gotten "for free" over time. Of course, you can change your stats several times in your character's first 20 levels, so this advice only applies as your are nearing the end of that introductory period. It is possible to change your stats later on, but at great expense - see Fixstats. The selection of skills will vary somewhat by the type of path preferred by the player. Although it is possible to create a sorcerer that does not primarily rely on magic for their offensive capabilities, this is certainly not a typical approach to the profession, and its discussion will be left for more specific guides on mutant builds. As such, it is generally assumed that the sorcerer will use a runestaff along with spells for their defenses, and various spells for their offensive capabilities. For proficient runestaff use, a character should have a training including at least 8 Magical Skills per level. It is also typical that a sorcerer will quickly begin converting physical to mental Training points, so do not worry about this inevitability. When discussing the cost of skills (both in this article and in general), the values are quoted as the Physical/Mental training points required at each level this skill is trained—a reflection of the in-game and web-browser training systems. 1x 8/0 Physical Fitness Necessary to firstly attain full Hitpoints and then as one of the few defenses available to sorcerers against maneuver attacks. 2x 0/24 Spell Research Learning new spells, increasing CS, and various increases to spells, such as AS, DS, TD, and general power. 1x 0/4 Harness Power Required to gain mana. This should normally be at exactly the character's level, then giving 3 mana per rank. 1x 0/2 Arcane Symbols A cheap magical skill, particularly useful with Scroll Infusion (714) to charge up unlocked scrolls. 1x 0/2 Magic Item Use A cheap magical skill, useful for using wands at low level among other applications, and useful with Scroll Infusion (714) to unlock unused scrolls for charging. 1x 0/3 Elemental Mana Control A cheap magical skill, giving benefits to a number of sorcerer spells, sharing mana, and access to mana spellup and mana pulse. It impacts the amount of mana needed to infuse scrolls and, at higher levels, the ease of animating the dead. 1x 0/3 Spiritual Mana Control A cheap magical skill, giving benefits to a number of sorcerer spells, sharing mana, and access to mana spellup and mana pulse. It impacts the amount of mana needed to infuse scrolls and, at higher levels, the ease of animating the dead. Note that only 7 magical skills per level are included here, but that the total number of training points allocated is not exhaustive. Some skills only need to be trained to achieve a certain threshold. Although in certain cases the thresholds may slowly increase with time, these are anyway basic skill levels that should be attained by every sorcerer. 0, 4 or 8 15/0 Armor Use No training to wear robes, 4 ranks for full leathers, or 8 ranks for double leathers (2% spell hindrance) . 0-3 15/10 Multi-Opponent Combat Several ranks goes a long way for some crowd control spells. Also an ideal use for Adventurers Guild badges. 10+ 4/0 Climbing To get around the environs up to level 20-30. May depend on region. 5+ 3/0 Swimming To get around the environs up to level 20-30. May depend on region. 10 0/3 Perception To get around the environs up to level 20-30. May depend on region. The way to use the rest of the points will depend on the player. 2.5-3x 0/32 Spell Research To increase Sorcerer Base CS, or learn more Minor Spiritual and/or Minor Elemental spells. 2x 9/3 Spell Aiming An "all or nothing" skill. Bolting (Fire Spirit (111), Web (118), Disintegrate (705), Balefire (713), Arcane Blast (1700)), picking a specific limb with Limb Disruption (708), focusing Energy Maelstrom (710) and Implosion (720) on a single target. Cheap magical skill. 1x 0/3 Perception Creature maneuver defense, Illusions, Foraging, Popping boxes. 1-2x 0/6+ Sorcerous Lore 1 rank of Sorcerous Lore, Necromancy to unlock Blood Burst. More ranks improve the damage and round time of Pain (711). Used Later in a sorcerer's career for Animate Dead (730) and to speed gathering energy for permanent Ensorcelling. Sorcerous Lore, Demonology helps phase treasure boxes to reduce encumbrance. Improves the damage of Balefire. Increases the retribution chance of Cloak of Shadows. Later on, helps with Minor Summoning (725) and Planar Shift (740). 2x 0/4 Arcane Symbols Longer duration for buff spells from scroll invokes. Greater ease in charging up unlocking scrolls with Scroll Infusion (714). Cheap magical skill. 20+ 0/7 Summoning Minor benefits early on to Curse (715). Unlock the bolt for Web. Increase targets and DF for Fire Spirit. Locate Person (116) benefits. There are three mutually-exclusive societies which a character can join. Once a character has resigned from a given society, s/he cannot rejoin the same one without resetting their society; characters are automatically granted one such reset, but attaining further resets is non-trivial. The major disadvantage in resigning from a society is all the relevant skills (and thus any work done to achieve them) are lost. However, a player can certainly feel free to explore the options. Roleplaying and play-style should, as usual, have a predominate role in the selection. The Order of Voln: Focused on slaying the minions of Luukos, some of the main highlights for sorcerers are the Symbol of Supremacy (which increases CS against the undead), and many utilities to cope with an untimely death, such as Symbol of Preservation and Symbol of Need while dead, Symbol of Recall to get back buff spells after death, Symbol of Dreams to more quickly recover from Death's Sting, as well as Symbol of Mana and Symbol of Renewal to get back spirit and mana a little more quickly. The Guardians of Sunfist: Dedicated to eradicating the Grimswarm, mechanically this society offers the least advantages to sorcerers. However, the ability to open a warcamp and find literally hundreds of creatures to slay anywhere in the world is definite perk, in particular for gaining necromantic power for Ensorcell. Sorcery is unusual compared to other branches of magic in that it is laden with historical significance. There are "forbidden" magics in the various cultures of Elanthia, with much of sorcery regarded as "the dark arts." House Faendryl was exiled from the Elven Empire for summoning demons and imploding the fortress of Despana. Halflings learned magic from an Illistim elf who was exiled for dark magic, and not long after lost all of their ponies to the Ardenai sorcerers. The Human Turamzzyrian Empire banned magic of "sorcerous" nature, and built the Demonwall to keep out "black elven wizardry." Necromancers often invoke the wrath of religious authorities. These things are largely the province of disdained races, or restricted within certain contexts such as the military. In other words, much of sorcery has a tenuous relationship with civilization, with some aspects more tolerated than others. Most towns will treat a demon in their jurisdiction, from casting Minor Summoning (725), as a crime which will get you arrested. Sorcerer Guild buildings are often located outside of towns for good reason. Nevertheless, it is up to you to abide by the laws of the lands, and show that their prejudices are hollow superstitions. Most sorcerers do not regard themselves as "evil", instead thinking of others as weak minded. Many sorcerers have "dark" personalities, which is not surprising, given the cruelty of our spells. Others might have dubious sanity. However, this is not a license for wanton violence, which will quickly backfire on you. Sorcerers are often arrogant or intolerant, and will not look kindly on having their art abused. This is especially true given the history of power downtweaks of our spells due to abusers that are vividly remembered by older players. It is important to know how to properly use your magic, especially area of effect spells that can unintentionally kill other adventurers. These include the spells Energy Maelstrom (710), Implosion (720), and Evil Eye (717) when used with Eye Spy (707). You should avoid using the area wide versions of these spells in hunting grounds where other people are present, and not at all if you do not know how to end them early. Casting spells is an integral part of any pure profession, and sorcerers not the least. This section outlines how to use spells, as well as highlighting important spells that are available to sorcerers. Casting a spell costs mana. The general rule-of-thumb is that the mana cost of a spell is equal to the last two digits of the spell's number; that is, Mana Disruption (702) costs 2 mana, and Energy Maelstrom (710) costs 10 mana. (The numbers before the ones and tens place indicates the spell's circle; the 700 circle is the Sorcerer Base.) A character can also never cast a spell when the last two digits exceed the character's level; that is, a level 1 character could learn Mana Disruption, but not cast it until level 2. Some spells have exceptions which do not follow this rule for the mana cost; the most common exceptions are either targeted versions of Area Effect spells will cost less, and buff spells with increasing benefits may also exhibit increasing mana costs. While these exceptions are also important to learn, for the general introduction to casting spells outlined here, we assume this rule applies (and will only use examples appropriate to this assumption). In order to attempt to cast a spell, a character must have at least one mana point, but preferably the character has mana points greater than or equal to the spell's cost. A character casting a spell without sufficient mana will incur nerve damage (or possibly death, although this is rare), the severity of the injury depending on the mana deficit and existing wounds. The character's mana pool will also go into negative numbers, reflecting the mana deficit. For instance, having a pre-existing level 1 nervous system injury (not a scar) and going below 0 mana will lead to a minimum of a level 2 nervous system injury. Level 1 nervous system wounds or scars do not impair the character's ability to cast further spells, provided they again have a positive mana pool. Level 2 nervous system wounds or scars will not only prevent the casting of any spells, but other actions as well (such as looting creatures). A sorcerer should always carry the necessary herbal remedies for all nervous system wounds and scars since accidents can happen and the penalties are severe; although it depends on the town, the common versions of these are: wolifrew lichen, torban leaf, bolmara potion, and woth flower. Major injury to the head, eyes, and arms can also prevent casting, so it is usually a good idea to carry these herbal remedies as well (but these will usually be externally, and not self-inflicted, injuries). So, your character has sufficient mana and would like to cast a spell. There are two complementary (and generally interchangeable systems) for doing so: the CAST (verb) and the INCANT (verb). CASTing a spell requires that it is first prepared, and also generally requires that a target is specified, unless it is an area effect spell (which is essentially cast at the room) or a buff spell to be cast at the character him/herself. INCANTing a spell can generally be done without specifying a target (and without preparing the spell); if it is a buff spell, it will target the caster; if it is a hostile spell, it will target a creature in the same room as the caster. The target will ordinarily be chosen at random, unless the caster first uses the TARGET (verb); subsequent incants will target the same creature, until the creature dies or fails to be in the same room as the caster (i.e. the caster or creature has moved). CASTing a hostile spell always requires the target to be specified along with the command, even for subsequent casts at the same target. There are several further nuances and related verbs, but before giving further details, some examples are useful. Suppose the character is out hunting, and encounters a giant rat. A level 1 sorcerer should know Blood Burst (701) and can cast it. A faint light trickles in through the cracks in the ceiling, as the tunnel continues to drop. In the distance, you can hear the faint scratching sounds of vermin being about their business. You also see a giant rat. MANA PULSE   - Manually invoke a mana pulse to gain mana as if you were off a node. MANA SPELLUP - Instantly cast all of your defensive spells. You are not experienced enough to harness such power! A giant rat tries to bite you! You gesture at a giant rat. A ragged wound rips open a giant rat's jugular, which begins spurting blood. An example of CHANNELing Mana Disrupt at a kobold. An example of INCANT, perhaps with two (different noun) targets in the room. An example of casting Elemental Defense I at the sorcerer. Example of casting a buff spell at a friend. Sorcerers have a very wide variety of gruesome and effective ways to defeat an opponent. Here are some highlights. Blood Burst (701): First sorcerer spell you learn, and cheap to cast, but low damage. Mana Disruption (702): This is a sorcerer's primary attack spell for many many levels. Decent damage for very modest cost. Corrupt Essence (703): Keeps things from casting spells at you. Mind Jolt (706): Stuns anything that is not immune to stuns, preventing it from attacking or casting. Limb Disruption (708): break a limb or blow it up. With sufficient Spell Aiming, you can target the right arm so your foe cannot attack or cast spells. Quake (709) (and Elemental Wave (410)) Chance to knock down every foe in the room and keep them down for a few seconds. Quake can also knock down foes in adjacent rooms. Energy Maelstrom (710): Do recurring damage to everything in the room, or with sufficient Spell Aiming, focus that energy on a single target. Pain (711): Damage a foe and put it in round time, that is, prevent it from taking any action for several seconds. Very useful against creatures immune to stun. Balefire (713) (and Fire Spirit (111)): ball spells, which target one foe but can hit everything in the room. Mana-intense. Evil Eye (717) scare a foe into running away, perhaps for good. Extreme success frightens the target to sudden death. Dark Catalyst (719) converts a foe's own mana to damaging elemental energy, consuming whatever mana is left to restore your own reserves. High damage, high likelihood of a kill shot, and high cost. Implosion (720) open a void in the area or, with Spell Aiming, next to a single target. Targeted version has a high chance of immediate death, but all the treasure is often destroyed as well. Of these, Mana Disruption, Disintegrate, and Dark Catalyst are perhaps the most-commonly used amongst most sorcerers. Sorcerers have access to a number of other offensive spells (or spells with an offensive component), which tend to be used somewhat less than those listed above: Phase (704), Curse (715), Disease (716), Torment (718), Unbalance (110), Web (118), Spirit Dispel (119), Elemental Blast (409), Elemental Saturation (413), Elemental Strike (415), and Elemental Dispel (417). Some of these are very useful in specific situations or with specific play styles; others are rarely used at all. Sorcerers have native access to buff spells from both the elemental and spiritual spheres. Furthermore, these can be supplemented with a vast number of additional spells from scrolls, as outlined in Evarin's guide. Many of these spells provide increased benefit as you learn more spells in the same circle. These effects have been omitted from the beginner's guide for simplicity. For specifics, see the individual spell pages. The following spells are included in the Minor Spiritual circle. They are generally not self-cast limited and can be stacked, except where noted. Spirit Warding I (101): +10 spiritual TD, +10 bolt DS. Spirit Barrier (102): +20 DS, -20 AS to melee, ranged and unarmed attacks. Self-cast limited, unless the target is warded. Spirit Defense (103): +10 DS. Stackable when self-cast, refreshable when cast on others. Disease Resistance (104): Additional warding against disease. Poison Resistance (105): Additional warding against poison. Spirit Warding II (107): +15 spiritual TD, +25 bolt DS. Water Walking (112): Allows a character to walk on water. Prevents slow down and allows dragging in marshy areas. Fasthr's Reward (115): Allows a second chance to defend against a failed warding. Self-cast limited. Spirit Strike (117): +75 AS on a single strike (or two minutes), not stackable. Lesser Shroud (120): +15 DS, +20 spiritual TD. Self-cast limited. Wall of Force (140): +100 DS, refreshable, short duration. It is typically useful to stack 101, 103, 107, 115 and 120 on yourself while resting and prior to going out for a hunt. 102 is useful for casters since it does not affect CS nor bolt AS. It can also be helpful for those who use physical AS while they perform a non-attacking task such as climbing, searching or foraging. This spell can be stopped. 104 or 105 can be helpful to stack when hunting or skinning certain creatures that are likely to disease or poison you. 105 can also be useful for foraging. If you live in River's Rest and intend to cross Maelstrom Bay, casting and stacking 112 is very useful. It is also useful in marshy areas (e.g. outside the Marsh Keep or in the Vipershroud), to keep from getting stuck in the mud. 117 can be useful for dangerous creature tasks through the Adventurer's Guild, when helping lower level characters with a hunt or in general if you just need the AS boost after finding a creature. 140 is very useful while foraging, searching for heirlooms, climbing over difficult obstacles, during invasions or other risky situations. The following buff spells are stackable and not self-cast limited, unless otherwise noted. The following buff spells are self-cast limited and can be stacked. Cloak of Shadows (712): +25 DS, +20 TD, plus a retribution spell that can get you out of trouble when stunned. Star Curse: +10 bolt AS. This is an unusual buff spell as it must be cast at creatures; once the targets are killed, the buff is added to the caster. Ensorcell (735): Adds life channeling flares. See the main article for more information. It is typically useful to stack 712 on yourself while resting and prior to going out for a hunt. It is typically useful to slay creatures under the influence of Star Curse before hunting with bolt spells, or to do it at the beginning of such a hunt. The temporary version of Ensorcell should be cast at the runestaff or weapon of choice on each login. Experienced sorcerers have access to a variety of very powerful and complex high-level spells, which many consider profession-defining and/or character-defining. As a beginner, it will be a while before you have access to them, but they're linked here so you what to look forward to. Minor Summoning (725): Summon a minor demon from another plane of existence to do your bidding. Animate Dead (730): Raise a fallen foe as your puppet, or walk a dead friend back to town. Ensorcell (735): Add permanent bonuses to weapons, runestaves, shields, and armor. Planar Shift (740): Best teleportation spell out there - the only one that can take you to any town from any other town. During your character's first 30 days, you have the option of switching skills at will, and stats several times. Many beginning sorcerers choose to train in weapon skills during this time in order to make it easier to hunt with their limited mana pool. They then switch away from weapon skills before before their 30 days are up. Two-Handed Weapons are a popular choice for this strategy, especially claidhmores. If you go the route of using a big two-handed weapon, you will want to also temporary set your Dexterity and Agility high enough to swing your weapon quickly (with a 5 second round time). See AGIDEX for details. Sorcerers tend to rely on warding spells, which work fairly well (or even exactly the same) no matter what your stance. You generally have the option to spend most of your time in guarded stance, which reduces the risk of injury from normal (AS-based) physical attacks. The combination of guarded stance and a using a runestaff means bolt spells are usually not a major concern. Sorcerers have defensive spells to aid with both elemental and spiritual TD, and that "spills over" into mental TD as well, so warding spells are rarely a concern. Creature maneuvers (most attacks without a visible roll) and combat maneuvers (like Disarm Weapon) will usually be your biggest vulnerability. The best defense is to avoid swarms and to preemptively disable foes who can perform those attacks, like with Mind Jolt or Limb Disruption, before they can attack you. These attacks are fairly rare at the lowest levels and become more frequent and dangerous as you progress to more advanced hunting grounds. You can improve the damage of Mana Disruption and Disintegrate by CHANNELing them with a more aggressive stance; see the spell pages for details. This page was last modified on 4 March 2019, at 10:53.